expelled never abandoned their Sephardic identity. They found their ways to Morocco, to the kingdoms and princedoms of Italy, the Ottoman Empire, Turkey, Greece, Egypt, Iraq, Syria, eastern Europe and Eretz Israel. Circa 120,000 Spanish Jews, who hoped that the ordeal would not last long, found a temporary shelter in neighboring Portugal. The Portuguese king, Joao II, allowed them to continue their lives there as Jews, together with 80,000 of their brethren that already lived in Portugal. However, four years later, the worst happened. Portugal had a new king, Manuel I, who decided for political reasons to marry the daughter of Ferdinand and Isabella. Their conditions for the matrimony included the expulsion of all Jews from Portugal. Manuel accepted the terms, but in his mind he conceived a plan that would allow for the expulsion in theory yet keeping the Jews in his kingdom. Their money and their knowledge were much needed for the king's plans of expanding his empire across the seas. The "expelled" Jews were deprived of all possible means of transportation out of Portugal. Within a very short period, most of the 200 thousand Jews besieged in Portugal were forced to the baptismal fonts. They had to change their names and identities with their religion. A scarce 5,000 succeeded in escaping before the edict was enforced. To placate the "new Christians," and possibly his own scruples, the King issued an additional decree, forbidding, for the duration of 20 years, any inquest on the religious behavior of the newly converted. This period was later extended to 50 years. He hoped that this would allow for a smooth habituation. The reality was different, and those who continued to practice judaism after the baptism were spied on and persecuted by the friars and the priests, and by the inflamed population. Yet, this period of "grace" allowed for the organization of a secret Jewish life with merely bearable interference. Clandestine synagogues were established, Torah and Talmud were studied in secret places, and simultaneously they went to churches and behaved in public as if they were Christian. Since then, the Jewish world has designated as "Anussim" those who were forced to become Christian in Portugal, but went on living as crypto-Jews. Their Christian neighbors referred to them by the injurious name of "Marranos" - as the converted Jews were called in Spain, in whose language it means "pigs." Obviously, not all the "New Christians" lived as "Marranos." There were those who assimilated in Christian society. The authorities designated all of them as "New Christians" to distinguish between "pure" and converted Christians, and kept track of this difference so carefully that people were known as "one-half New Christian" or "one-quarter or one-eighth New Christian." Naturally, those who continued to practice their Judaism secretly, married only among themselves and were thought of as "full New Christians." In 1535, the Catholic Church established a court of exception in Portugal, designated to purify the country of the many "heretic" transgressions. They called it the Holy Office of the Inquisition. During 300 years, people were arrested; their property was confiscated; they were held in prison for many years; they were mercilessly tortured and often burned alive in public acts, known as "auto-de-fe." The accusation could be as little as cleaning their houses or changing clothes on Friday, lighting candles for Shab bat, fasting on Yom Kippur, or eating Matzoth on Passover. I have consulted quite a few of the 44,000 files of the Inquisition kept in the National Archives of Portugal - my birthplace. I keep photocopies of some of them at home. Each time I read them, I am moved again, when faced with the heroic deeds of simple people who clung to the "Torah of Moses" and persevered, generation after generation, passing one to another not only the principles of the religion, but also the tradition that they were Christians only in public but Jews in their hearts. Most important, they taught their children the tradition of keeping secret their lives at home, even at the price of death. Those among the Marranos whose strength persevered, found a way to leave the "land of the Marranos" during the Inquisition years. They publicly returned to the religion of their ancestors in free lands. They went to Southern France, Holland, Germany, England, later to Brazil, Surinam, Curacao and to the United States. However, the Marranos did not entirely disappear in Portugal. From time to time articles are published on those who have remained there and continue to hide their Judaism. 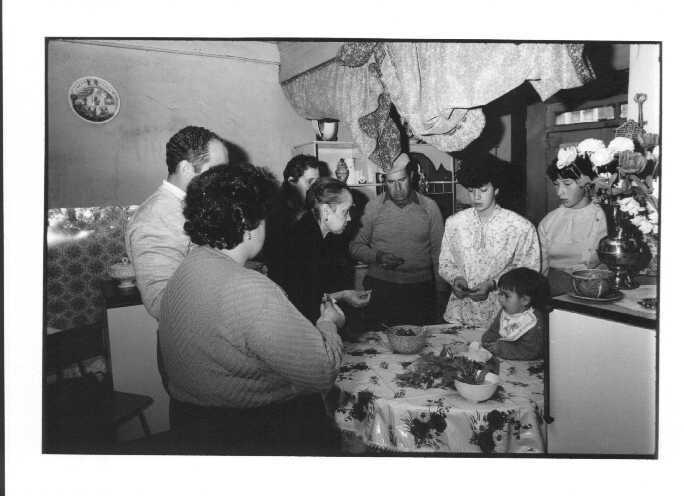 In 1963, in Lisbon, I met a Marrano family for the first time. One year later, I visited them in a village and met dozens of other families. Amazingly, it is as if history stood still there. The same families known two or three centuries ago to be false Christians, continue to live in the same places and are known to the population as Jews. Some are devoted and sincere Christians. Others still observe Jewish rituals and kept the same tradition of secrecy and absolute prohibition of revealing their religious acts to outsiders. the same language, I let them also ask questions. They wanted to know what has happened to Judaism since their forefathers unwillingly converted to Christianity and contact was lost with mainstream Judaism. Thus, with patience and perseverance and with respect for their reluctance, I am accepted each time and trusted with a new revelation. Since my "aliyah", in 1976, I have returned to Portugal for many visits. start of the Jewish month of Nissan. As part of the tradition meant to fool the spies of the Inquisition, they postpone the holiday until what Jews call "Pessah Sheni" - one month later. Therefore I knew that it was Passover for them now. Passover being their most sacred and secret ritual, I had always been asked not to come at that time of the year. From the moment we arrived we felt that we weren't being received in the usual manner. People avoided us. Even my best friends weren't inviting us to visit them. Knocking at their doors, we were not asked in. They apologized and asked us to come back at a different time. From the door we saw the women of the house - busy cleaning the floor. Some took me aside on the street, or in the cafe, and explained that our presence had been discussed between and had already caused much dissidence. Meanwhile we saw that certain women went to the fields and came back with bunches of herbs. Reluctantly they showed us five different kinds. These were the "bitter herbs" which only they knew how and which they shared with the rest of the families. In the afternoon we learned that a conflict had arisen in the village. Word had spread that a particular family had agreed to our presence for the first ceremony. There were those who thought that this wasn't an issue to be decided privately by individuals. All of the community was in danger. In one breath, they mentioned the Inquisition, the Nazis, and the Arabs. "We promised, and so it will be,' the old patriarch said to me, his voice trembling with emotion and fear. He invited us to come to his house at sunset. We came early, as the members of the family were flocking in, the children, grandchildren, and great-grandchildren, all-in-all around 30 people. Men, women, and children were wearing their holiday best. bitter herbs, one small pile of the five species for each person. Everyone took one portion of herbs in his hand. Then the elderly mother opened a small box, the size of a cigar box, from which the corners of a white napkin were showing. Inside she had many slightly burned balls of dough, the size of partridge eggs. She raised the bitter herbs and pronounced a blessing: "Blessed art Thou, 0 Lord our God, who has sanctified us with Your holy commandments who commanded us to eat the bitter hers." (Her blessing was said in their native tongue, as are all their prayers - only the world Lord Is said in Hebrew - Adonai). Then she ate the herbs with a grimace. Everybody did the same after her. Then, she lifted up the small box in her right hand, covered her left eye with her hand and said another blessing: "Blessed ... on the eating of the matzoth that our forefathers ate as they exited Egypt. Even as we have attained the merit of seeing this matza today, so should we have the privilege of baking it tomorrow and eating it during the holy holiday. This year here, next year in the Promised Land." Then she made her husband recite the same blessing after her. of the family blessed one another for a happy holiday before going their separate ways. I asked where the matzoth were. Somebody whispered that they don't bake the holy bread before the second night, on account of the Christian spies, and that the balls of dough were kept from previous festivals, year after year. That was the extent of their explanation. Again we were warned that this was as much as they could allow us to see, let alone photograph. The next day, the first day of Passover, we did not see our friends in the streets. Only in the late afternoon we saw that every family was loading strange parcels onto their commercial vans and driving out of the village. We found a place in one of the vans, traveling with them as they drove to the nearby river. On the bank of the stream they opened the bundles, taking out their Passover utensils which they then washed in the stream-water. This included several white china bowls and small clay ovens. "This must be done in running water," they explained to us. At the end they wrapped everything in white sheets and left for home. Walking around in the village, upon our return, we met a very dear friend of mine, who nevertheless had also refused to allow us to take part in the ceremonies. He asked me to come and see him in his house, alone. I went to see him. have the right to challenge the decision of 'our family'. It is not only for reasons of secrecy. There is much more to it that you don't know." My friend, who by the way has an excellent social standing in the village, argued that he didn't owe them anything and was not afraid of retaliations. I tried to convince her myself. "Look," added the perplexed woman, "There is much more to it as I said. Even more than what I am going to tell you. We believe that this night is the night when we are told if our sins have been pardoned or if we are condemned. You see, while baking the holy bread we take apart a small portion from the dough and put it in the fire first, If it bursts with a noise it means salvation; if not we are lost. How well do you know this photographer? Are you sure that he is a Jew? He is a very nice person, but how do you know that he is not deceiving you?" I reassured them about his Jewishness. My friend's wife finally agreed to have us at their ceremony, but only on one condition: if, at any moment, she would feel the need to, she would ask us to leave and we shouldn't be offended. Catholic children who were mocking the Jews. We went up to the attic. The whole room was dark, except for a small lamp in the stairwell. The window was shut and covered with an additional curtain. The youngest son came to receive us. He said that his parents would soon come up. The people were very tense and uneasy because of our presence. The room had been emptied of all furniture. There was lust one strip of white sheet across the floor, dividing it in two. On the window side, to the east, there was an oven made of clay, filled with glowing coals. Two red slate tiles rested on the hot coals. The room was full of smoke that hardly dispersed. Later it became difficult to breathe. The young man left and a few minutes later the family members came up one after the other, the father, the bachelor son, and the mother. All were dressed in white from head to toe. Everyone wore white socks, without shoes. The woman wore a white kerchief over her hair, the men wore a sort of white baker's hats. The woman took a small pitcher in her hand and sprinkled water on the room, on the utensils, on the men, and on herself. Afterwards, they knelt down on the sheets, facing east. Each took a white china bowl and filled it with flour from the bags and water from the pitchers. Suddenly the bells in the church sounded very loud in the silent night. It was 10 o'clock. They obviously sounded every hour on the hour. At this moment, however it was terrifying, as if to remind us that we were strangers in a Catholic land. They kneaded the dough, while the woman prayed in a low voice and the men repeated after her. more intense, more full of conviction. The atmosphere became very tense and not only due to the heat and the smoke. I cannot judge how much time went by. Suddenly we heard clearly the sound of a burst. "Whose was that?" she asked. The husband answered that it was hers. She continued to pray with fear and joy. We heard a second explosion, that of the son's, they claimed; one minute later a third. Obviously, out of excitement, she had put several additional balls of dough on the fire and this one again was hers, according to the husband. Finally, we also heard the sound of the husband's ball of dough. Then everyone was relieved and broke out in song about the exodus from Egypt and the splitting of the Red Sea. They invited us to come closer to also put some balls of dough on the fire. Fortunately mine burst immediately. That of Frederic, the photographer, exploded later and even lumped out of the oven. "He is Jewish," said the good lady. Everyone kissed each other in great happiness and excitement. They began to prepare the matzoth - pieces of relatively thick dough that they placed on the fire. Taking them out of the oven, they put aside one out of every seven. "Charity for the poor,' they explained. I asked if there were many poor Jews in the village. No, there were not, but when there are no poor, the families exchange matzoth - somewhat like gifts sent on Purim ("mishloach manot"). 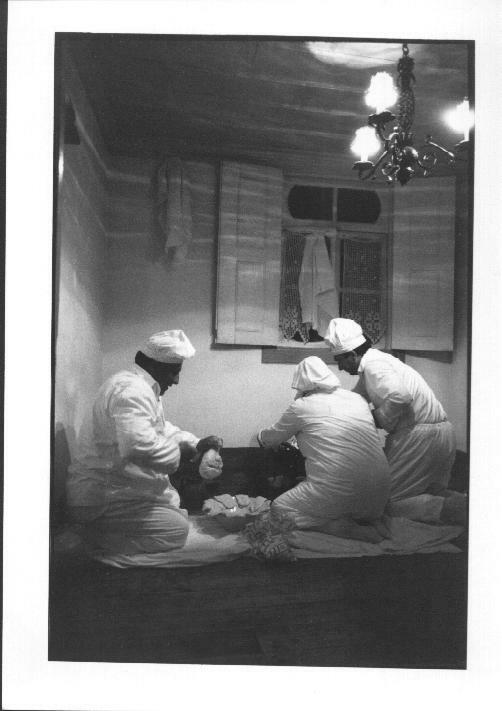 The white clothes which they use for the ceremony of baking the matzoth, are kept only for this night, every year. When a person dies it is the custom to bury him in these white clothes which he wore on the nights of the unleavened bread. This reminded me of the "kitel the white gown that religious Ashkenazi Jews wear for Yom Kipur and in which they are later buried. From that night on we felt that we had become members of the family: they behaved that way and we had the same feeling. I will never forget the noble gesture of that lady and the anguish that she went through on my behalf, and I am most thankful. brook that passed through the farm and crossed from one bank to the other, "cutting" the water with olive leaves while reciting the story of the parting of the sea and the exodus from Egypt. These branches of olives leaves and dried and used to light the coal oven the next year. From the farm, we saw the river we had been to the day before. The other Marranos were there "crossing the sea" (in the river they built a stone path near one of the banks, and crossed from there). During the eight days of the holiday no Marrano opened his shop or went to the markets. When the weather allowed, they went on picnics in the fields far from Christian eyes, ate matzoth "so that the Lord will see, sang and danced - and we joined them. We, too, tasted the matzoth. To be honest, they were barely tolerable and hard. However, that is the bread of misery," they told us. During these eight days it is forbidden to eat meat or dairy products. On the last day, before eating anything else they must eat bread and cheese. They call it "leaving the holiday". It is difficult to believe that things like this still happen. I am glad that I could document them because I am not sure they will continue to exist for much longer, although they were maintained for 500 years at the risk of death. For me it was an unforgettable experience.